GEELONG has locked away Quinton Narkle, Jack Henry and Esava Ratugolea to contract extensions off the back of exciting debut seasons. All three have put pen to paper on new two-year deals. Ratugolea has extended his summer re-commitment to 2021, while Henry and Narkle have signed until the end of 2020. The trio joined the Cats at the end of 2016, Ratugolea (pick 43) and Narkle (pick 60) taken in the National Draft with Henry (pick 16) taken in the Rookie Draft. 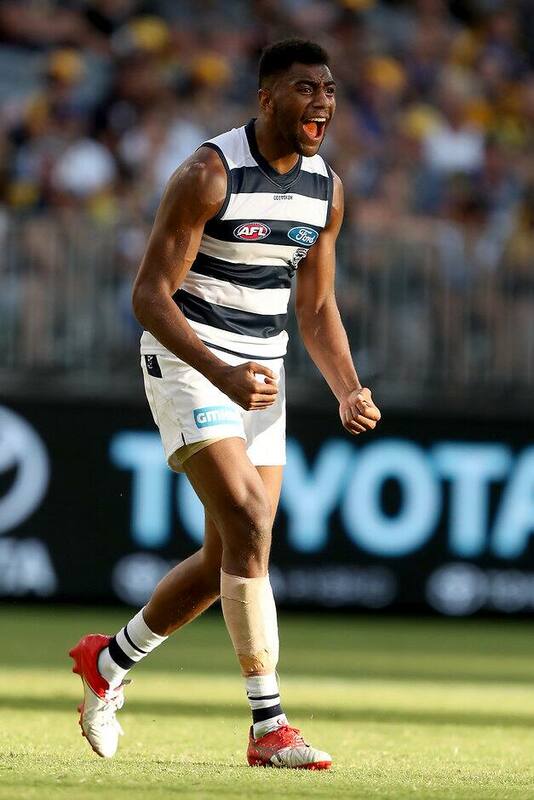 Narkle, the most recent Cat to debut in round 15, has played four games after overcoming a 2017 ACL reconstruction. "When we all got drafted it was a big draft so to sign on with all the boys (is great), we've become pretty close over the years," Narkle said. "To spend these extra years with the boys and the others, hopefully we have some success down the track." Henry has played all 16 games since his debut in round two, holding a key role in defence before the return of Lachie Henderson against Melbourne on Saturday night. Thrown forward, the 19-year-old rookie kicked his maiden goal at a crucial stage of the third term in the last-gasp win against the Demons. "It was a pretty easy decision to sign on, I've always loved this club growing up," said Henry, a local product from St Mary's. Ratugolea has put his hand up for a late-season return after a broken ankle suffered in round 10 against Carlton. The 19-year-old burst onto the scene in the opening rounds of the season with his aerial ability and defensive pressure. The extensions will allow Cats list boss Stephen Wells to turn his attention to securing other signatures. Unrestricted free agent Daniel Menzel is expected to ramp up talks for an extension in coming weeks. George Horlin-Smith, also an unrestricted free agent, remains in limbo. Other Cats out of contract include Rhys Stanley, Jackson Thurlow, Jordan Murdoch, Cory Gregson, Aaron Black and rookies Jamaine Jones, Sam Simpson and Stewart Crameri.